Growing up in Liberia, West Africa, my true desire had been to be a doctor. At the time, I felt that it was the best way that I could help the people in my community. My upbringing, my experience as an immigrant in the U.S., and Higher Ground International has shaped me into who I am today. While I am not a physician, I espouse the same beliefs about helping those in need that I held firmly to as a child in Liberia. I had a privileged and idyllic childhood. But in the midst of that comfort, however, I was surrounded by abject poverty, oppression, inequality, social injustice, violence and abuse of women and girls. I was particularly stricken by the wanton violence and neglect of half the community. Women, often beaten and abused, were also saddled with children whom they had to care for by themselves. But, there was also another unspoken abuse; the molestation of little girls and even as a young girl, I felt that I needed to take action to right some of the wrongs that I had witnessed. I would often use the money that was supposed to pay my school fees to help the native women, even if in small ways. I did not realize, then, that I was preparing for a vocation outside of medicine – one that would help ease the suffering of the forgotten, neglected, and abused – a life’s work devoted to healing different kinds of wounds. I attribute my strength and perseverance to my mother. “Moma,” as I called her, was born into poverty, and lost her mother when she was only one month old. She was left in the care of her father, a fisherman, and his sister in Mary Land, a remote rural county in Liberia. Moma was only able to obtain a third grade education and her marriage to my father became a source of contention for his family. His mother and sister – my aunt and grandmother, were well educated, cultured, and affluent. In their eyes, Moma was not good enough. The indigenous or native people whom they (including my beloved Papa) openly called “country people” were not good enough because they were not one of my father’s class. Nevertheless, Moma was a renaissance woman. She had the innate ability to create pathways of opportunity for many people who experienced similar hardships that Moma knew all too well. She took in strangers and extended family members who needed a chance and countless indigenous/native children who became “brothers and sisters” to my biological siblings and me. Moma made sure that they were educated and received equal treatment to her own children. There was always food in our home for anyone who came by and was hungry. Whenever I showed my displeasure with her taking in so many disadvantaged children (mostly because of Papa and his family disapproval), Moma would be quick to remind me, “I am preparing you for tomorrow.” I did not realize that I was being prepared for an important journey. Moma is in her nineties now. She lives in Liberia and when the load seems heavy, she encourages me to continue to push forward because she knows that if she could do it, I can do it too. My immigration to the U.S. heightened my own awareness of blatant discrimination, hate, inequalities’ and social injustices. HGI’s RUKIYA CENTER, which I founded and have been operating since 2015, is located in the heart of South Providence. In the two years since we have been in this location, it is impossible to bear witness to human suffering, and the social and economic disparities that exist within the community, and turn a blind eye. Like Moma, whoever comes by the RUKIYA CENTER who is hungry, I offer them something to eat. It is a safe, welcoming and loving space. I can honestly say that I have been in training for my work with Higher Ground International throughout my entire life. God has blessed me with an amazing family, HGI’s team and so many people who love me and believe in this vision to help restore dignity, uplift and improve the quality of life for those who are marginalized, unseen and forgotten in communities here in Rhode Island and the rural villages in West Africa, Liberia. Henrietta Tonia White-Holder is a humanitarian, social entrepreneur, community builder, and passionate advocate for the disadvantaged and underserved. In 2008, using an unexpected “gift” of $1,000, became the visionary founder and CEO of Higher Ground International, a non-profit NGO bringing clean water and sanitation to her native Liberia and mending broken lives resulting from the prolonged civil war in the country. 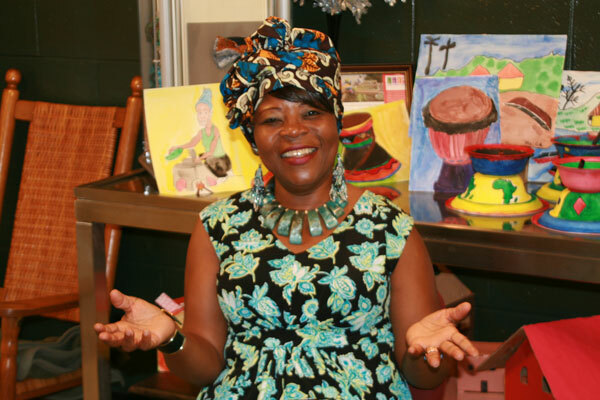 She has been actively involved in her local community, lobbying to end the 14-year civil war in Liberia and was on the forefront of community integration and empowerment for newly arrived war affected young Liberians in Rhode Island. In 2015, Higher Ground International saw further progress, with the opening of its new RUKIYA (African word, meaning: Rising Up | Progress) CENTER on the South Side of Providence. The Rukiya Center focuses on intergenerational programs, women and youth empowerment, the Sweetie Care Program for African immigrant and refugee elders as well as workforce and literacy programs. White-Holder has 24 years experience working in the non-profit sector in Rhode Island – 18 of which she served as a residential director supporting individuals with differing abilities. She is a currently participating in the Executive Director Leadership Circle at the United Way of RI and is a 2011 graduate of Leadership Rhode Island. She has received numerous recognitions for her work with the most recent being The Providence Newspaper Guild – 2017 The John F. Kiffney, Public Service Award. Winner of a 2009 Metcalf Award, recognizing professional journalists for creating stories that promote diversity. Powered by WordPress and Oxygen. Maintained by Meaghan Lamarre.